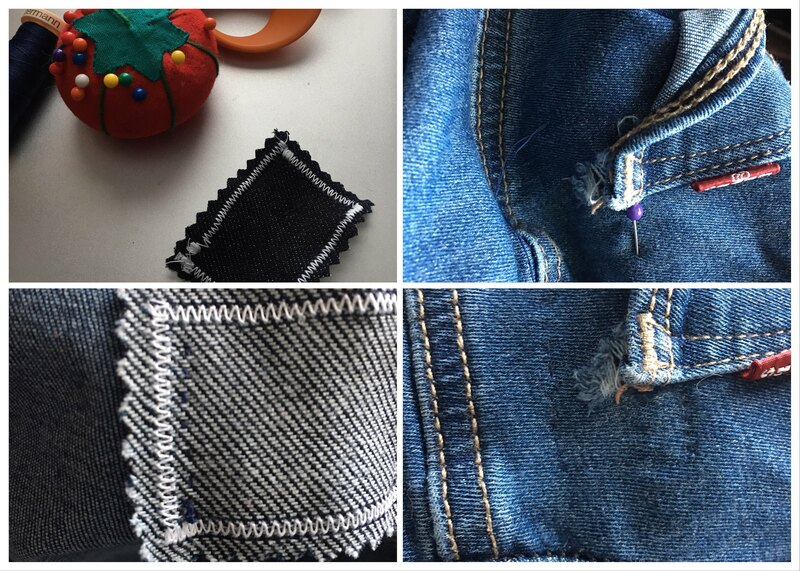 Denim Repairs: Visible Mending with Embroidery Thread – Good Things. I love the look of artful visible mending on clothes. 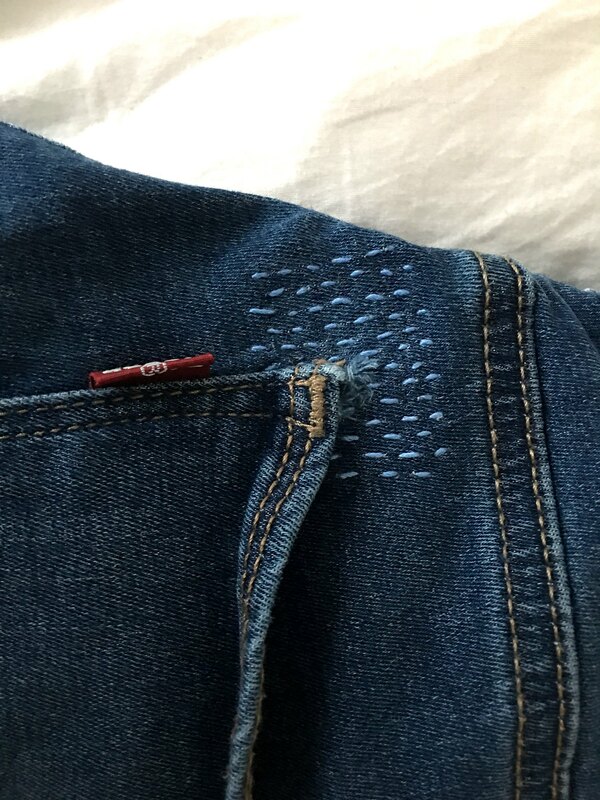 The back pocket on an old pair of jeans got snagged a few months ago, leaving a quarter-inch hole that let underwear show through. Instead of tossing the pair (what I would have done in the past), I decided to fix it. Initially, I was going to try a simple, invisible darn, like in this image. However, the more I researched, the more I was inspired by visible mending from blogs like tomofholland (see this and this), and Japanese sashiko-style mends. So, I decided to give it a try myself. Counter-clockwise from top left: (1) Project materials, including my denim patch. (2) Patch pinned under the hole, beginning stitching around the edge. (3) A full row of stitches in navy thread. (4) Borders of the patch fully sewn in. I already had some extra denim bought for another project. I cut a small rectangle, machine-sewed the border with a zig-zag stitch, and pinked the edges. I placed the patch under the hole, and hand-sewed around the edges with dark navy thread. The navy is almost (I think) invisible from the outside. Once my patch was fastened in place, I sewed vertical rows of stitches in light blue embroidery thread– you’ll see this in the photo below. I worked over the entire patch, then secured my ends with a few carefully-placed knots. When I started, I wanted my patch to be covered in little stitched crosses (++++). However, I found that I didn’t need to add the second layer of stitches to achieve a secure final product, and when I did attempt crosses they weren’t able to keep their distinct shape due to how short the first direction of stitches were. I think the patch looks great as it is now. 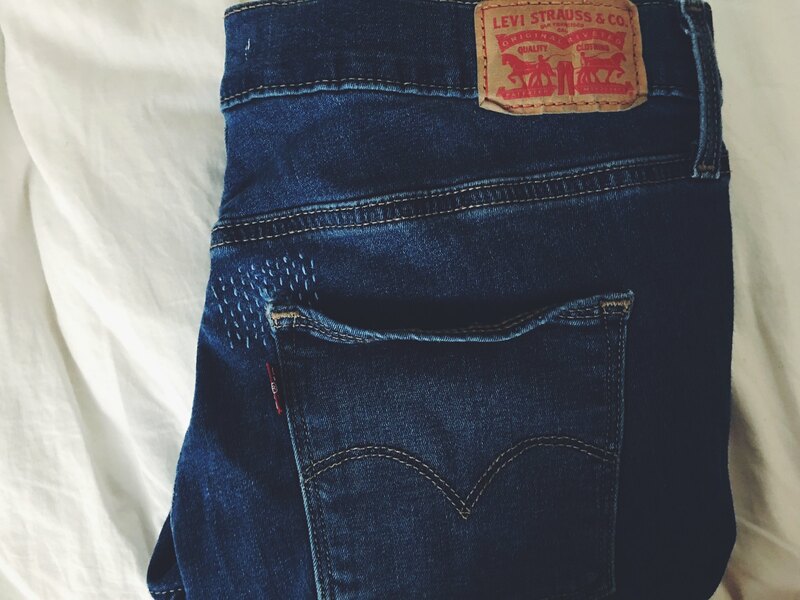 I can’t wait to keep wearing my jeans, and add more patches in different colors and textures as the jeans wear out.